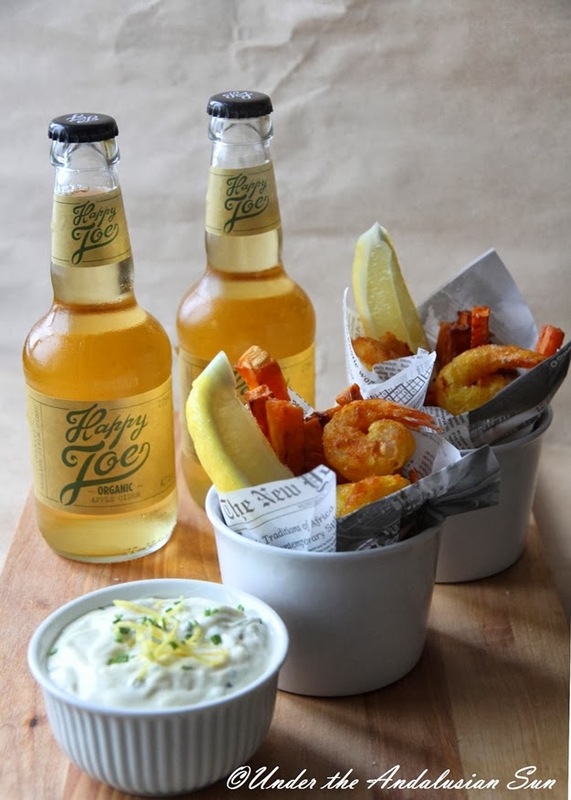 As I told a little while back, Hartwall's Brewery invited food bloggers to come up with recipes to accompany Happy Joe Organic Apple Cider they've just launched. We equipped ourselves with a hefty dose of British brilliance and came up with flightly fancier fish & chips. Let's see what the judge, Sami Tallberg makes of these - the winner and his/her friends will be treated to a fancy dinner cooked by the man himself! As a main this is enough for 2. As a party dish this feeds 4. The tempura batter can be made entirely out of regular flour too. Chick pea flour is widely availabe in ethnic stores. Let the prawns thaw. If using raw ones, peel them but leave the tail intact. Peel the sweet potato and cut into chips of appr. 1 cm thickness. Soak them in ice water for a good half an hour (this will get rid of some of the starchiness and help them fry nicely) , pat dry and fry in oil until golden and crunchy. Drain on kitchen towel and sprinkle with some salt. Put the cider in the freezer for about an hour. In the meanwhile make the tartar sauce by combining the ingredients. Keep in the fridge for about an hour before serving. Mix the dry ingredients of the tempura batter. Then pour in the ice cold cider. Mix quickly into a smooth batter. Dip the prawns in the batter and fry in hot oil. Drain on kitchen towel and serve immediately.